Good morning friends! Today's post is my second set of OPI Pure Lacquer Nail Apps. 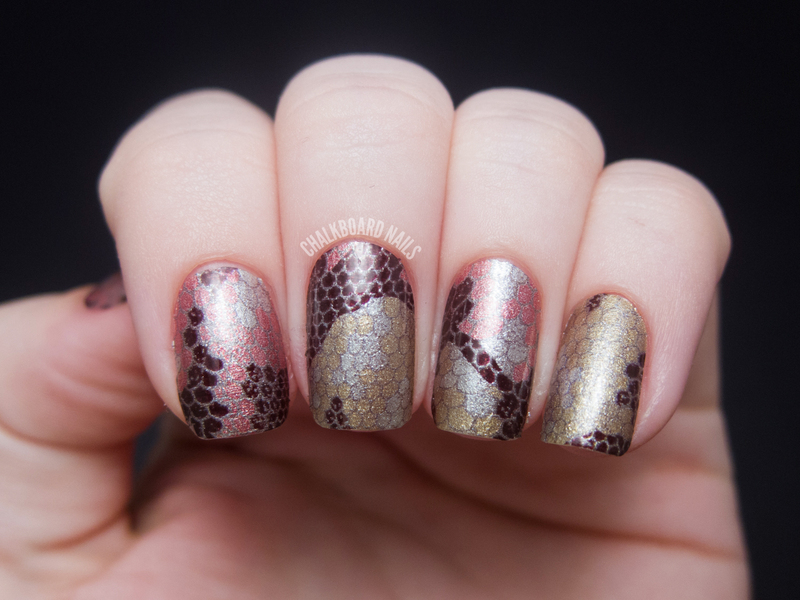 This design is called Reptile. You can view my last Pure Lacquer Nail Apps post here, which shows another pattern, Girly Glam, and also goes more into the packaging. While the Girly Glam patterned wraps were considered part of the "shimmer" line, these ones are from the "creams" line. As you can see, they look kind of metallic, and they aren't made of glitter pieces like the other set was. Application is done the same way as the other set of strips that I tried -- super easy! You only have to select the size you want to use on your nail, peel it off the paper, stick, smooth, and then file off the excess at the tips. You don't need to use base coat or top coat. It's instant nail art for people that don't want to spend a lot of time on their nails! Also of note, in my first post about these wraps, I told you guys I would try to save my leftovers from the previous pack and see if they would last. They don't. I put them back in all their packaging and then sealed that up in a plastic bag, but when I took them back out, they were dried up and unusable. Use 'em if you've got 'em. If you have a lot of extras, have a nail session with your roommate! I think, if you are interested in trying out nail wraps, the OPI Apps are a great option. They are easy to use and they come in really unique and sophisticated designs. OPI Pure Lacquer Nail Apps are available at Professional Salons, including Beauty Brands, Beauty First, Chatters, Dillard’s, JCPenney, Pure Beauty, Regis, Trade Secret, and ULTA, for the suggested retail price of $11.95. The product in this post was provided to me by the manufacturer or their PR. This is so pretty! I have never had luck with these. I got some SH nail wraps super cheap at Ross the other day and now I'm itching to try them out! Love this design! I've been obsessed with doing my toes with these nail wraps. You don't have to wait for them to dry and they last me over a month! Gonna have to look for this design next. i'm really impressed with the designs of these so far... don't like the price but i think i may have to try a few. Including this one! i've never tried a wrap yet but these are so pretty. i'd definitely try these if i did nail wraps! wahou this one is beautiful! These do look great - they look like they could actually be painted, rather than the foil ones that crease and tear. Wow this is absolutely gorgeous!